The next day we travelled over the High Atlas Mountains on some very windy roads with spectacular views. We crossed over Tizin’Tichka Pass which was 2260m above sea level. Along the roadside there were many little souvenir stalls and lunch today was in a roadside restaurant. Once again, the selection was couscous, tagine, skewers, berber omlette or Moroccan salad. We then continued onto, (as it says in the trip notes) to the end of the road at Imlil. We stored our luggage, hired a mule to carry our backpacks and walked up hill for about an hour to the village of Aroumd where we stayed the night in a gite (family run mountain home). 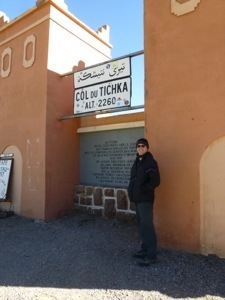 We had views of North Africa’s highest peak – Mt Toubkal. Dinner was a tasty chicken tagine. After dinner we decided to play a game of cards, unfortunately the packs of cards that belonged to the gite were all incomplete and we couldn’t get a complete pack to play any game. We sat around and talked for a little while, telling the odd joke or two. Andrew entertained the group with donkey jokes! What do you a call a donkey with three legs? A wonky donkey! What do you call a donkey with three legs and one eye? A winky wonky donkey! etc Morocco is a land of donkeys and there were always plenty on the side of the roads or in the villages/towns being used to carry loads of various things. The next morning we went on a brief walk around the village and decided not to opt for the 3 hour mountain walk which was all up hill. After a relaxing morning and delicious lunch cooked by our hosts, we returned to our van and travelled towards the west coast. En route we stopped at an Argan Oil factory where we learnt how this oil is made and used. Then onto Essaouira which is on the Atlantic coast. It is a very picturesque town and was originally called Mogador. It is a busy fishing port and our local guide took us through the old medina, Jewish mellah (quarter) and sea wall which has many cannons along it. On our walk through the town we came across two local men removing the hair from sheep heads which were then sold by the butcher. The hair was used as fuel for heating the hammam, making the whole steam house experience even more bizarre. We spent two nights here and enjoyed wandering the streets and looking in the art and souvenir shops. Inlaid thuya wood and silver jewellery are the specialities of the area and we managed to pick up a few souvenirs of this tranquil seaside town. Our final stop in Morocco was Marrakech which is a large city. 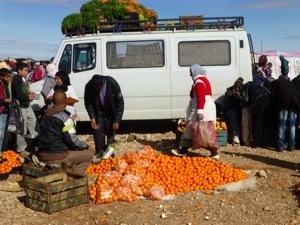 We caught the local bus from Essaouira and arrived early evening after a three hour trip. That night our group were taken to the main square, Djemaa el Fna which has UNESCO World Heritage listing. It is full of snake charmers, acrobats, amateur boxers, henna artists, fortune tellers, medicine men, dancers and any imaginable type of entertainment. At night temporary tents and kitchens are setup and you are enticed in by the “restaurant” owners to eat at their establishment, known simply by their allocated stall number. One owner guaranteed us 2 years “diarrhoea free ” if we ate at his stall and another stall owner told Andrew he was so skinny he would die if he didn’t eat immediately. Having both experienced a few days of diarrhoea during the trip, the first offer of a “diarrhoea free meal” was very tempting! Hassan our guide, took us to a particular reputed stall and we had skewers along with moroccan salad and char grilled eggplant and capsicum. The next day we were free to explore and we headed to Jacque Majorelle Gardens (now owned by the estate of Yves Saint Laurent) and they were very impressive. 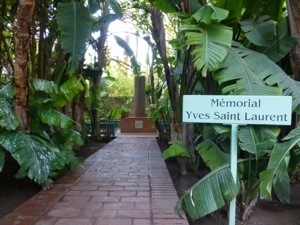 There was a lot of water and bamboo along with a memorial to Yves and this is where his ashes were scattered. There is also a Berber museum within the grounds and it was of very high quality with artifacts from all parts of Berber’s daily life including jewellery, cooking, clothing, ceremonial dress, bee keeping etc. We had a coffee at the adjoining cafe before heading back to the hotel and then onto catch the city hop on/hop off bus. This took us on a 70 minute tour of the city and the major sites of interest. 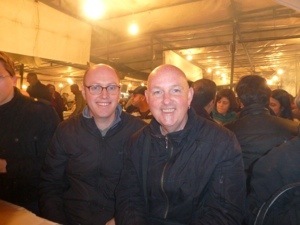 Tonight’s dinner was once again in Djemaa el Fna and we ate with Chie and James and tried our luck at one of the other stalls and all was good. Two young women tourists from Norway sat beside us (who had just arrived that afternoon) and looked shell shocked so we educated them in the ways of ordering and eating (as well as providing sanitiser hand wash for them and their utensils). The previous night we had discovered a warm drink with spices (bit like chai tea without the milk) so we warmed up with another cup. It was so hot and spicy that we assumed it would kill any bad bacteria consumed during dinner!! Our final day in Morocco was spent further exploring Marrakech including Palais Bahia which is a superb example of Muslim architecture with many tiled walls and patterned ceilings. The Saadian tombs are recently discovered tombs of past rulers and their families of Marrakech. We wandered the souks and Christopher purchased a couple of pairs of prayer beads to add to his collection. Dinner tonight was at the old post office hotel which was very colonial in nature and full of tourists. 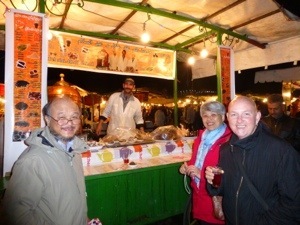 Christopher had a moroccan version of lasagne whilst Andrew ate tagine (just for something different)!! And so ends our time in Morocco – a fascinating country that in some ways is a fusion of Europe and Africa. 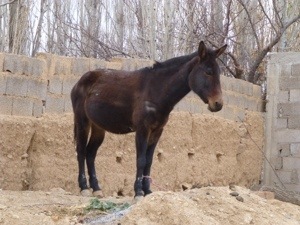 A country of mandarins, donkeys and stairs! A country of unforgettable experiences. 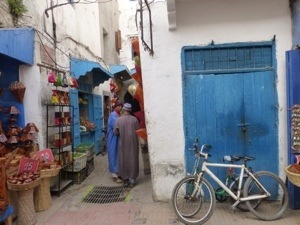 Enjoying the trip blog thanks for text messages time is flying seems Morrocco was a great evperience. food Wedding went well hot day plenty shade a beautiful setting. William & Erinn fly out for Vanuata on Thursday. Talking to Joe last night very happy in Bendigo.Has changed his course to sports science which has only become available there this year will lead to more openings . Haven,t heard of Susie, haven’t seen Nick. Take care Love Dad & Mum. Hey Christopher, wish I had of read your post before we arrived in Marocco! We are currently in Touradant, heading to Essouira. We have been here for 8 days and have been diarrhoea free, thankfully!!! Hope you and Andrew are well.